How did great writers structure their stories? And, beyond that, how did they think of story structure? In On The Writing Heinlein discusses a number of ways of structuring science fiction stories with special emphasis (of course) on how he did things. His talk is fascinating and ends with what became his famous 5 rules of writing. This isn't the sort of story Heinlein wrote, but he said he enjoyed reading them. "I have nothing against the gadget story--I read it and enjoy it--it's just not my pidgin. I am told that this is a how-to-do-it symposium; I'll stick to what I know how to do." "There are at least two principal ways to write speculative fiction--write about people, or write about gadgets. ... Most science fiction stories are a mixture of the two types, but we will speak as if they were distinct--at which point I will chuck the gadget story aside, dust off my hands, and confine myself to the human-interest story, that being the sort of story I myself write. "There are three main plots for the human-interest story: boy-meets-girl, the Little Tailor, and the man-who-learned-better. Credit the last category to L. Ron Hubbard; I had thought for years that there were but two plots--he pointed out to me the third type." Heinlein writes that although there is often romance in SF stories that, in his day at least, it was less often the case that the romance was "the compelling and necessary element that creates and then solves the problem [emphasis mine]". And, of course, those are just the start of the variations! Today's stories have boy-girl, girl-boy, boy-boy and girl-girl. "Now to make it a science fiction story. Time travel? Okay, what time theory--probable-times, classic theory, or what? Rejuvenation? Is this mating necessary to some greater end? Or vice versa? Or will you transcend the circumstances, as C. L. Moore did in that tragic masterpiece "Bright Illusion"? I've used it twice as tragedy and shall probably use it again. Go ahead and use it yourself. I did not invent it; it is a great story that has been kicking around for centuries." "... this is an omnibus to all stories about the little guy who becomes a big shot, or vice versa." - David in the Old Testament. Heinlein notes: "It is the success story or, in reverse, the story of tragic failure." "The man-who-learned-better; just what it sounds like--the story of a man who has one opinion, point of view, or evaluation at the beginning of the story, then acquires a new opinion or evaluation as a result of having his nose rubbed in some harsh facts. I had been writing this story for years before Hubbard pointed out to me the structure of it." - Heinline's own "Universe" and "Logic of Empire"
- Jack London's "South of the Slot,"
- Dickens's, "A Christmas Carol." "... a man finds himself in circumstances that create a problem for him. In coping with this problem, the man is changed in some fashion inside himself. The story is over when the inner change is complete--the external incidents may go on indefinitely." A lonely rich man learns comradeship in a hobo jungle. A strong man is crippled and has to adjust to it. A gossip learns to hold her tongue. A hard-boiled materialist gets acquainted with a ghost. "This is the story of character, rather than incident. It's not everybody's dish, but for me it has more interest than the most overwhelming pure adventure story. It need not be unadventurous; the stress that produces the change in character can be wildly adventurous, and often is." a. The protagonist finds himself/herself in circumstances that create a problem for him/her. b. In coping with the problem the protagonist is changed in some fashion inside himself/herself. c. The story is over when the inner change is complete. i. The new conditions (the change in the protagonist's circumstances) must be an essential part of the story. ii. "The problem itself--the "plot"--must be a human problem. The human problem must be one that is created by, or indispensably affected by, the new conditions." iii. "And lastly, no established fact shall be violated." "But don't write to me to point out how I have violated my own rules in this story or that; I've violated all of them and I would much rather try a new story than defend an old one." "I've limited myself to my notions about science fiction, but don't forget Mr. Kipling's comment. In any case it isn't necessary to know how--just go ahead and do it. Write what you like to read. If you have a yen for it, if you get a kick out of "just imagine--," if you love to think up new worlds, then come on in, the water's fine and there is plenty of room." It is in this speech that Heinlein gives his famous 5 rules. Although I've come to the end of what I wanted to tell you about Heinlein and his comments on story I'm going to include the rest of his talk, below, because I got such a kick out of reading the original. Maybe you will too. "I'm told that these articles are supposed to be some use to the reader. I have a guilty feeling that all of the above may have been more for my amusement than for your edification. Therefore I shall chuck in as a bonus a group of practical, tested rules which, if followed meticulously, will prove rewarding to any writer. "The above five rules really have more to do with how to write speculative fiction than anything said above them. But they are amazingly hard to follow--which is why there are so few professional writers and so many aspirants, and which is why I am not afraid to give away the racket! But, if you will follow them, it matters not how you write, you will find some editor somewhere, sometime, so unwary or so desperate for copy as to buy the worst old dog you, or I, or anybody else, can throw at him." 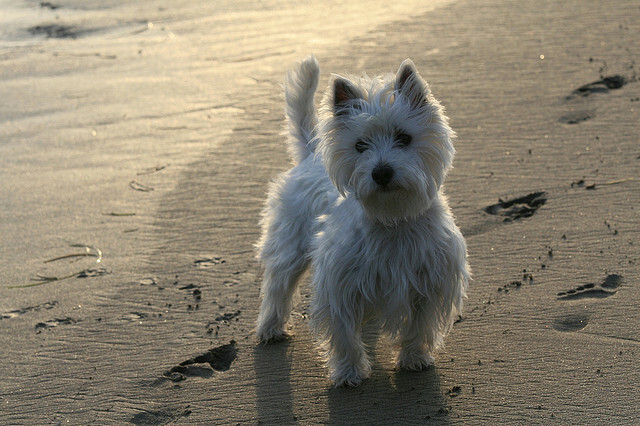 Photo credit: "Wee Westie Backlit on the Beach" by Randy Robertson under Creative Commons Attribution 2.0. Robert A. Heinlein was my first, and still one of my favorite, contacts with reading for entertainment. His speech was televised when I was in high school and drew my interest to writing. Thank you so much for recalling this wonderful discourse to my memory. Thanks Ric, for your kind words. Heinlein was both a fabulous writer and an extraordinary human being. I would have loved to have seen that speech! Fascinating stuff. Thanks for digging it out of your bookshelf. Excellent post! Word of the master! I have no idea how long your post has been up, it is now April of 2017. Still, I have read probably better than 90% of RH's writing and he was also my first and remains my favorite SciFi writer. I have tried my hand (pen, computer???) at writing several times and I just may have found the motivation to try again. I quote RH probably more than Frank Zappa!! That's wonderful! It makes my day whenever someone tells me I've had something to do with helping them get motivation to write. Heinlein's writing helped shaped an entire generation, especially "Stranger in a Strange Land."